Wrap up a refreshing takeout-fakeout recipe for Thai Spring Rolls with Peanut Sauce. We all have that one restaurant (or perhaps more than one) that’s been our go-to for ages. Our culinary Cheers of choice. Where everybody might not know your name, but they sure as heck know your order. That place for me is a hole-in-the-wall Thai restaurant called Spice and Rice in my hometown of La Jolla, California. While I’ve had the opportunity to enjoy Thai food cooked by some of the greatest chefs in the business, Spice and Rice does it all the best, from pad Thai perfection all the way through the greatest coconut sticky rice with mango. I’ve managed to recreate both a stellar pad Thai and a creamy, sweet sticky rice recipe at home, but never had I mastered Spice and Rice’s always refreshing spring rolls. 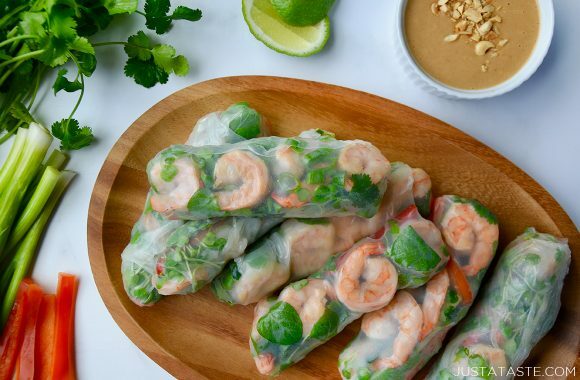 These Thai spring rolls are loaded with fresh veggies and herbs and can be made with your choice of shrimp, chicken, tofu or entirely veggies (hearty fillers like rice noodles are an option, too!). But what are spring rolls without peanut sauce? This homemade version is creamy, sweet, savory and a touch sour, making it the ultimate partner for this no-cook appetizer, snack or lightened-up main. Fill a large sauté pan halfway with water. Bring it to a gentle simmer then turn off the heat. 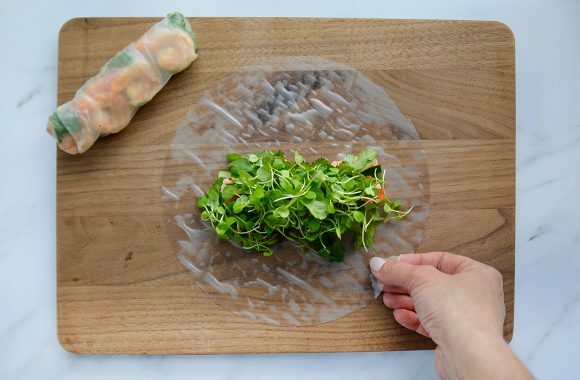 Dip each sheet of rice paper into the warm water, rotating it around until it is pliable but not too soft. 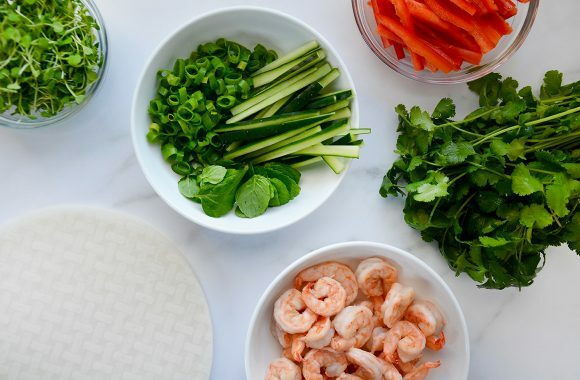 Place the rice paper on a clean work surface then add a portion of the shrimp, micro greens, cilantro, mint, bell pepper, scallions and cucumbers on the bottom third of the rice paper. Starting at the bottom, tightly roll the rice paper up over the fillings then continue rolling as you tuck in the sides (similar to a burrito). Repeat the filling and rolling process with the remaining sheets of rice paper. Combine all of the ingredients in a food processor and process until combined. If the mixture is too thick, add room-temperature water, 1 Tablespoon at a time, until it has a pourable consistency. Serve the spring rolls with peanut sauce for dipping.